I love grilling out on my back deck. Some of my favorite foods to grill are salmon, chicken, hamburgers and fresh vegetables. 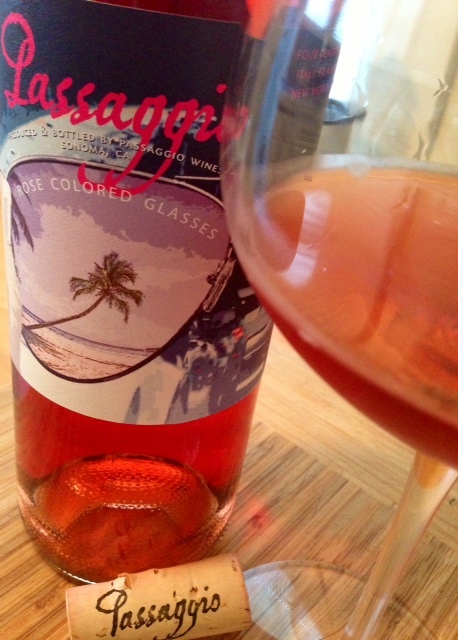 Hamburgers go great with the Passaggio 2012 Rose Colored Glasses. If you have a grill and you love inviting friends over, here’s a great recipe and a great wine to pair with it. I got this recipe, Mini Pesto Burgers, from one of my favorite books called 100 perfect pairings written by Jill Silverman Hough. I thought this recipe was a great one to pair with the 2012 Rose Colored Glasses…perfect for those hot summer days. In the bowl of a food processor, combine the basil, Parmesan cheese, pine nuts, garlic, 1/2 teaspoon of the salt, and 1/4 teaspoon of the pepper and pulse to finely chop, scraping the bowl as necessary. With the motor running, slowly add the olive oil and process until smooth, scraping down the bowl as necessary. Set the pesto aside. Shape the beef into 6 patties, about 3 inches in diameter and 1/2 inch thick. Cut the provolone cheese into slices so that they are 2 1/2 inches in diameter. Prepare the grill to medium high heat and lightly oil the grate. Sprinkle both sides of the patties with the remaining 1 1/2 teaspoons of salt and 1/2 teaspoon of pepper. Grill the patties to desired doneness, about 3 minutes per side for medium. During the last minute, place a slice of provolone cheese on top of each patty and place the rolls cut side down on the grill, to melt the cheese and lightly toast the buns. Place the tomato slices on the bottom halves of the rolls. Top with the patties, pesto, and the top halves of the rolls and serve.